To access your account via the API you'll need to create an API Key and API Secret Key for authentication. 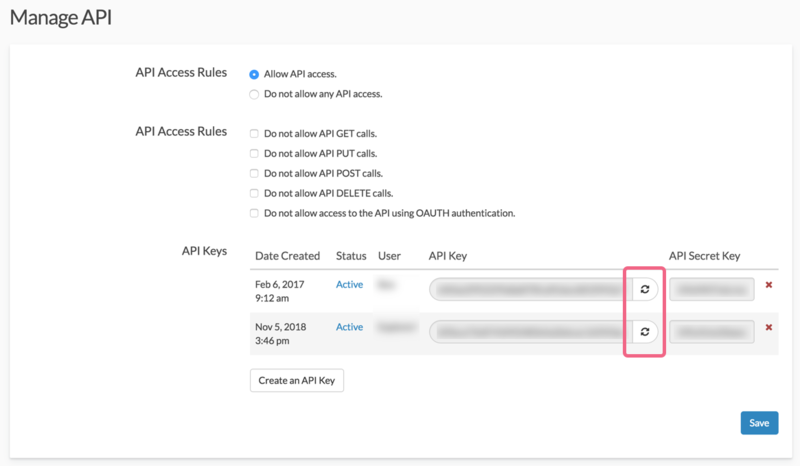 To obtain an API Key and API Secret Key administrative users can go to Account > Integrations > Manage API and click Create an API Key. As API Keys are generated per user so you'll need to select the user for which you wish to generate keys. Make sure to generate keys per each user that accesses the API. All API Keys for all users will then display on the API Settings page. If at any time you suspect that a user's API Key has been compromised, you can click the Regenerate API key button to create a new key. What Happens if a User Tries to Authenticate with an Old Key? "message": "Login failed / Invalid auth token"
If you are simply creating a key for a new user this will not affect any of the other keys set up in your account. For non-admin users once your account administrator has generated a API Key for you this will be available under Account > Integrations > API Key. If you do not have an API Key here, contact your account administrator to generate one. To authenticate using OAuth, you'll want to first register your plug-in/application. Each plug-in application you register will be provisioned a consumer key and secret. This key and secret scheme are similar to the public and private keys used in protocols such as ssh for those who are familiar. This key and secret will be used, in conjunction with an OAuth library in your programming language of choice, to sign every request you make to the API. It is through this signing process that we trust that the traffic that identifies itself is you is, in fact, you. When installing or activating your SurveyGizmo Plug-in, the user should be presented a "Connect to my SurveyGizmo account" link in your application. This will seem like quite a bit of work, but it's actually quite straight forward from the user's perspective. You'll need to pass over a few parameters with this call outlined below. Your OAuth library will actually take care of most of this. The parameters you will have to provide to your library are: The SurveyGizmo URL, Your Callback URL, Your Consumer Key, Your Consumer Secret. The last two are obtained when registering your application. Pretty easy! oauth_consumer_key Consumer Key provided to you when you signed up. oauth_signature_method The signature method that you use to sign the request. This can be PLAINTEXT or HMAC-SHA1. oauth_signature The Consumer Secret that was issued to the application. If you are using the PLAINTEXT signature method, add %26 at the end of the Consumer Secret. oauth_timestamp Current timestamp of the request. This value must be +-600 seconds of the current time. xoauth_lang_pref (optional) The language preference of the User; the default value is EN-US. oauth_callback SurveyGizmo redirects Users to this URL after they authorize access to their private data. This page will ask the user to authenticate the request and give access to API data based on the user who authenticates. If you wish to customize this page with the name of your application you may pass additional parameters such as: custom_pluginname=Your+App+Name. Note: You'll note that your redirection URL is not part of this second step. That's a security measure in OAuth - it was provided in the original request for a token, so don't panic! Once the user authenticates access to his or her data, they will be redirected back to the callback URL you provided during the initial request. You will then get back a parameter called oauth_verifier. This and your request token can now be traded for an Access Token which will be used for all future calls to the API. To get the access token you must pass the oauth_token and oauth_verifier returned by the previous endpoint (typically handled by your OAuth Library) to the following end point. The access token will include the oauth_token and oauth_token_secret. You should store these in your database and use them to sign future calls. In order to authenticate with OAuth, you need to add all of the following variables to your API call. As you can see, there are quite a few! You can do it yourself or use a library that automatically generates the oauth_signature method, oauth_timestamp, oauth_version, and oauth_nonce. oauth_signature The concatenated Consumer Secret and OAuthToken Secret separated by an "&" character. If you are using the PLAINTEXT signature method, add %26 at the end of the Consumer Secret. If using HMAC-SHA1, refer to OAuth Core 1.0 Spec, Section 9.2.
oauth_token Provided by the call to access_token.